As other local tech companies announce bad news, Simple seems to be weathering the season. 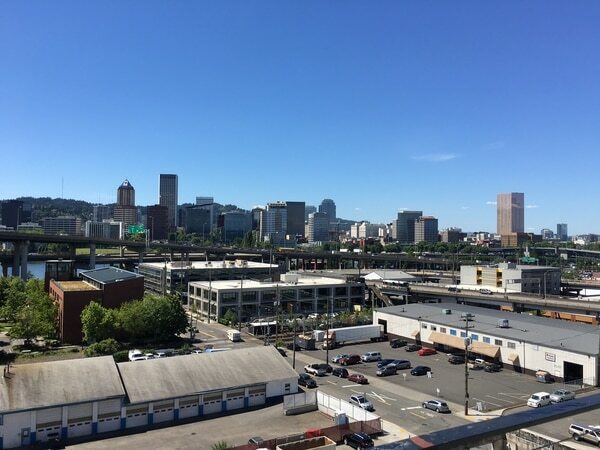 At least one Portland tech company is making it through spring with some good news. The city's tech industry has had a tough quarter. Last month, Intel announced massive layoffs that will cut hundreds of jobs in Portland's suburbs. Yesterday, Palo Alto's Jive Software announced it will be laying off 14% of its global workforce, which could affect up to 100 people at their downtown Portland office. But Simple, a virtual bank that operates from a smartphone and browser interface, is more fortunate. 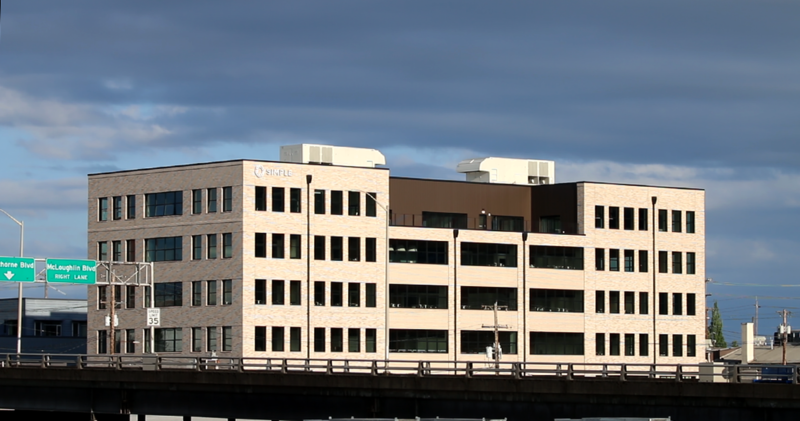 At the end of this week, the financial tech company will be moving from the Pearl District to a swanky new six floor office building in the Industrial Eastside. Simple's new headquarters takes over the site of the former Rexel/Taylor Electric Supply building on Southeast 3rd and Clay, which was destroyed in a 2006 fire and had since been used as a public performance space. The new building, whose parking lot maintains some of the Rexel/Taylor building's graffiti-smothered facade, will house Simple in four of its six floors. The new building gives Simple a chance to reflect its company values in its layout and design, a concept that Simple co-founder and CEO Josh Reich spoke to as central to Simple's ethos at TechFestNW 2016 last month. 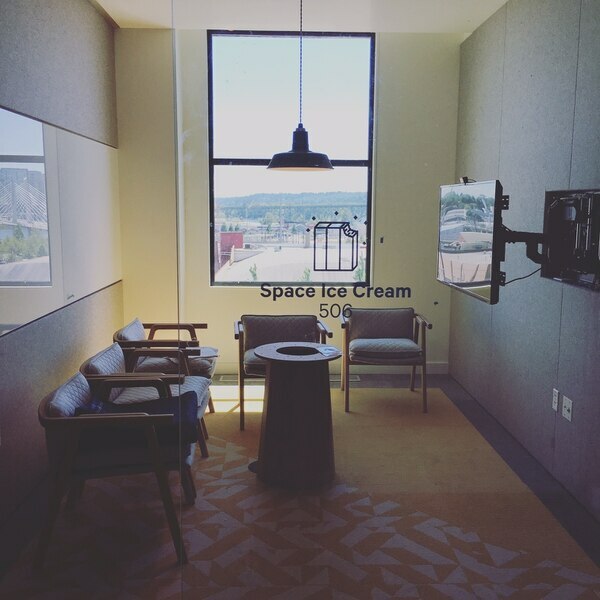 All floors and conference rooms have been given whimsical names like “Space Ice Cream.” Fun! "We wanted our new space be a home base rather than a corporate headquarters," said Valarie Hamm Carlson, Senior Brand Director. "It's open and welcoming, has a playful spirit and reflects the craft we put into everything we do." 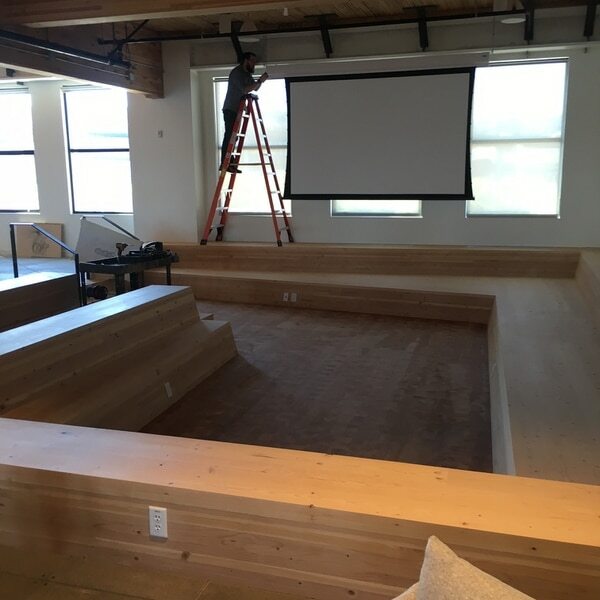 With finishing touches still being put on the building, Simple's new office is something out of a tech startup dream. It sports a sweeping open plan layout with extensive public work and meeting areas. Floors and conference rooms are given whimsical names such as "Space Ice Cream," and are kept open through extensive use of paned-glass. Simple employees— including senior executives— are encouraged to work together in shared spaces and communicate openly between departments. The top floor sports multiple quiet rooms, a games room and a large rooftop patio with quite the view of downtown Portland. The view of downtown from Simple’s rooftop patio. 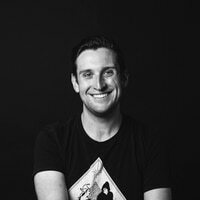 Founded in Brooklyn, New York in 2009, Simple moved to Portland's Pearl District, where they are headquartered until their move to the east side office at the end of the week, in 2011. Following their $117 million acquisition by Spanish multinational BBVA in 2014, Simple faced a rocky period in which an email leak revealed that the company was struggling to grow its customer base. Since then, Simple appears to have bounced back, tripling its workforce to around 300, and hiring big name executives in 2015. Simple now manages over 100,000 customer accounts and over $1 billion in transactions per year. Simple's new office space has capacity for around 500 employees. We know of at least a couple companies whose former employees may be applying.